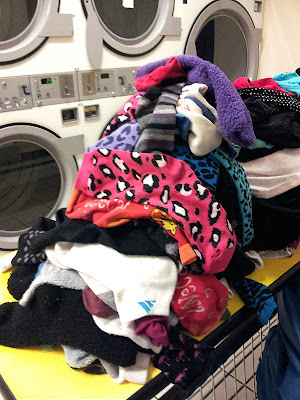 While doing laundry last night, I noticed something had gone missing. But something is not right. 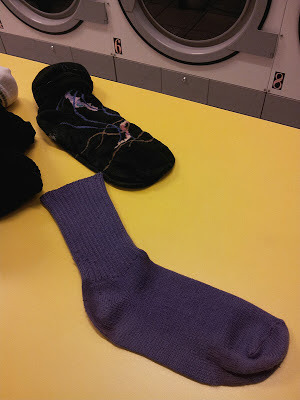 And, here is the problem...a single purple sock. I know it's a given to lose socks in the laundry. That's one of the rules of the universe. But, this particular sock (or, what should be a pair of socks) holds special significance. This purple sock is 28 years old. That's right, I received these socks as a Christmas gift in 1985 and have been wearing them continuously ever since. That pair of black socks in the background of the photo above dates back to 1997, but they aren't holding up so well - the heels are developing holes. But the purple sock is as good as the day it came into my life. Which is why the loss of its mate has me so upset. It's not that this is my favorite pair of socks because there are others I like more. The fact that it is purple isn't that important, although I have never bought another purple pair because I always had this one. But, at some point, maybe around the turn of the century, I began to appreciate how long these socks have lasted and how they have never left my side -- er, feet -- throughout many adventures. These socks went to college with me. We've lived together in eight cities and two countries. We've walked the floors of 13 jobs. We've gone on countless trips and these socks have outlived every pair of boots they've ever met. Maybe the mate is just taking a break and hiding under the bed. I dread the thought of it walking out of the laundromat in the basket of a stranger who might just throw it out, knowing nothing of its past. Thanks, Grieve. There will be a service this weekend. Well, this is just too sad! Have you contacted Prince yet? Good call! I'll ring him as soon as I'm off the line with Boy George. Update: The missing purple sock has returned! It had eloped with a blanket that was put away for the summer.